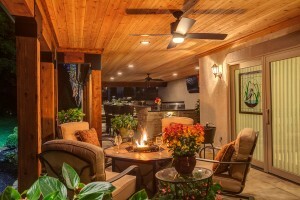 An outdoor kitchen is one of the most desirable features for homeowners today. During the winter, begin planning the layout for the ultimate cook’s entertaining area. Once the warmer weather hits, you will be able to host family and friends in a unique, comfortable setting. Take full advantage of yard spaces by transforming a bland patio into a fully equipped kitchen that you’ll love using. When designing your outdoor kitchen, you have to select the appliances that you need and want. Options include a refrigerator, wine cooler, gas range top, grill, and even a dishwasher. If you love barbecue, then you’ll likely want a gas or charcoal grill, and perhaps even a smoker. Storage space below the counters will make it easy to store dishes and utensils. You can make your outdoor kitchen as luxurious or low key as you want. Low counters are ideal for prepping up food before tossing it on the grill. Even if you are working with a small space, you will want to have at least one area of the counter that is installed at a lower height. If space allows, add bar height counters where guests can sit and relax. This makes it easy to chat and spend time together as you cook. The ability to entertain and prepare food at the same time is what makes an outdoor kitchen so great. Having an outdoor entertaining area that you truly love to use will make parties and casual gatherings much more enjoyable. You can prepare all of your favorite dishes for friends and family, without feeling like you’re spending all of your time alone in the kitchen. There are no limits to the features that can be included, so get creative and design the kitchen of your dreams right in your back yard. Many people underestimate the importance of an attractive outdoor living space, and few realize that an attractive outside environment is crucial for complementing the outward appearance of your building. Consider some of the following ideas to consider for your outdoor space, and see how Hidden Tree Landscaping can help you achieve the desired results. Think about expanding your patio space and creating a more attractive and engaging design around your home overall. You will be surprised by what a little bit of innovation around your deck can do for the rest of your home’s appearance, not to mention for your own personal comfort. If your outdoor environment could use a little bit of fine tuning, do not hesitate to make the decision to better define it. This involves adding new fixtures, trimming a few trees or shrubbery, and any number of other applications that can create a unique and personalized style around your property. Consider decorating seasonally as well, especially if you have a larger property that you want to showcase as the weather and local scenery changes. This type of project will require personal dedication, but ultimately there are no limits to how attractively it can complement the rest of your outside decor. A spacious yard can be much more than just a pretty place to sit. Make your property unique by turning part of your yard into a gorgeous garden, growing a variety of fresh fruits, vegetables, and herbs. Not only will it provide delicious fresh foods, but it can also blend in beautifully with an elegant landscaping design. The winter season is the ideal time to start planning the layout of yard spaces that are functional and attractive. By planting a garden of any size, you will be adding value to your yard by making it useful and functional. Enjoy healthy, fresh fruits and veggies without purchasing them from a farmer’s market or grocery store. It isn’t about saving money on produce and herbs, but about transforming part of your yard into something truly valuable to your family. Many plants are desirable because of their vibrant colors and lush textures. There are plenty of ways to use edible plants in a landscaping design. Lettuces and cabbages are a fine example of plants that can be grown alongside grasses and flowers. You could opt for raised beds, which can be achieved by using wooden boxes and framed areas for different plants. This is a great way to make the most of space, as well as to keep the garden organized and neat. You get a variety of heights, layers, and textures, giving the garden a lush look. A simple way to dress up any landscape design is by adding natural materials like stones, brick pavers, and even wood. Just because you’re growing edibles doesn’t mean that you can’t incorporate natural elements. Place stones around raised beds, use pavers to make walkways between plants, and add wooden trellises for vining plants to grow along. When planning a landscape design for your yard, be sure to include an area for an edible garden. You can enjoy fresh foods, as well as a variety of colors and textures.